A ‘fairy tale’ exchange is set to happen with exotic elephants from India headed for Russia, while Siberian tigers, white lions, nasuas, llamas and Sajmirs will make India their home. The animal exchange agreement between zoos in Yalta and Thiruvananthapuram, in India’s southern Kerala state, will allow this exchange. The Taygan Lions Park and the Skazka (Fairy Tale) Zoo in Yalta, Crimea, have concluded an animal exchange agreement with the Thiruvananthapuram Zoo. Russia will now get elephants, tigers, lions, and nasuas, RIR learned from Oleg Zubkov, the director and creator of ‘Skazka’ and Taygan. “We dreamed about having elephants for more than 15 years. We sought opportunities to obtain these animals from zoos located in Europe and Africa,” he said. He said that during this period, “the first elephant house was built in the Taygan”. Finally, the management decided to focus on obtaining Asian elephants, which are smaller and more manageable than their African cousins. “At the moment, we are awaiting final approval from the government authorities in the Indian state of Kerala, after which we will be able to sign the corresponding contract and arrange for transportation of the animals,” said Zubkov. Under the agreement, in exchange for three elephants from India, the Thiruvananthapuram Zoo will receive two white lions, 15 nasuas (coatis), two Siberian Tigers, two llamas, and five Sajmirs (squirrel monkeys). A source familiar with the negotiations said there are plans to bring in seven elephants from India, in exchange for zebras. The elephants will be accompanied by mahouts (handlers/keepers). This is a requirement stipulated in the transport legislation of India. 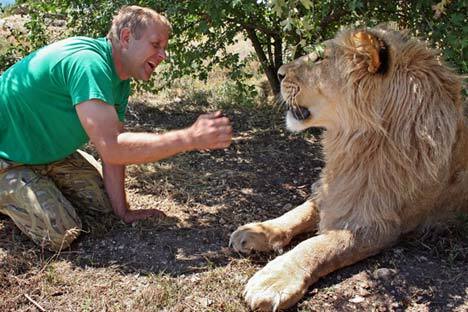 Zubkov said, “This is an important step for rehabilitation of the animals. I would be glad if these mahouts stayed in Russia forever. However, if that is not possible, then I hope they will teach our staff all they know about the care of these animals. A mahout, who usually takes care of an elephant from its birth, is difficult to replace,” he explained. Taygan was created in 2012 in Belogorsky Region of Crimea, on the shores of the Taygansky Reservoir. It soon became not only the largest nursery in Europe for various breeds of lions and other species; mostly large mammal predators; but also the only one of its kind animal park on the continent. More than 50 African lions roam free there; practically in their natural habitat; in an area of ​​over 30 hectares in the Crimean foothills. The Skazka Zoo was created at Yalta in 1995. It is now home to more than 100 species of animals and birds. According to Zubkov, around 350,000 people visit Taygan every year. Another 250,000 visitors come to the Skazka. “We expect that once the bridge connecting Crimea with the rest of Russia is completed, the attendance at each zoo will reach 500,000 people annually,” he said. The Sansarafan Company, an inbound tour operator in India, will provide assistance in organizing the transport of the animals.